EM-Tec F12 is a basic yet practical FIB grid holder for 2 FIB grids. Based on the standard Ø12.7mm pin stub, it is compact and useful for storing valuable samples. The 10mm wide vise clamp includes a ledge for easy positioning of the FIB grids. Pin stub type only. EM-Tec F25 is a larger FIB grid holder which can accommodate up to 5 FIB grids of the same thickness. The 25mm wide vise include a ledge for easy positioning of the FIB grids and two brass thumb screws to operate the vise. Available with pin stub and M4 threaded hole. 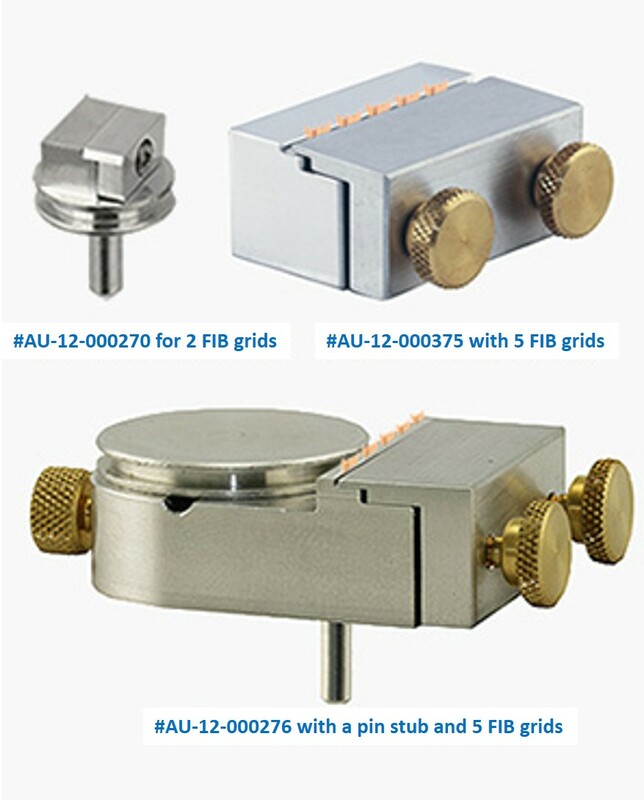 These holders can all be used on th FIB and FIB/SEM systems from FEI, Zeiss and Tescan. For the EM-Tec F25 and FS25 is an M4 version available for Hitachi SEMs. For JEOL FIB/SEM system use a suitable EM-Tec stub adapter.